I want to be a Calgary Police Officer. What do I need to do? Becoming a police officer is one of the most challenging and rewarding careers that you can choose today. As a police officer, no two days will be alike, you will meet many different people with very different backgrounds, and you have the opportunity to specialize in a given skill or move up through the ranks to attain senior status. Police officers are called to assess risks and save lives, to help others through trauma and the most difficult days of their lives. If you believe in following the law and finding justice, and you want a job that truly makes a difference in society, then perhaps becoming a police officer is the right fit for you. Which police force should I join? Canada has a variety of police forces, with nearly all major cities operating their own police force. Ontario, Quebec, and Newfoundland and Labrador also operate their own provincial police forces. Additionally, the RCMP (Royal Canadian Mounted Police) is a federal police force, providing police services for most Canadian provinces and investigations and security for the Canadian government. Each of these has their own requirements to join, but in this article, we will discuss how to join the Calgary Police. These are the strengths that make a good Calgary Police Service officer. No unpardoned criminal convictions, criminal charges pending before the courts, or criminal activity within the last three years (both detected and undetected). Remember, you will be allowed to apply if you meet these requirements, but meeting them does not guarantee you will be hired. The application process for the police is competitive. Minimum of two years post-secondary education and/or consistent employment history. Work experience involving a position of responsibility and trust. Application packages are available online and at the recruiting office located at 5111 47 Street N.E., Calgary AB. Once your application is received, it will be reviewed to ensure the information is complete. If it is, you will receive notification indicating it has successfully been reviewed and is awaiting assignment. As per provincial guidelines, anyone interested in a policing career must write the Alberta Communication Test (ACT) and the Alberta Police Cognitive Ability Test (APCAT). The Alberta Communication Test takes 1 hour and 35 minutes to complete (including instructions and break). It is designed to assess an applicant’s ability to communicate in writing. While both tests are required for the application process, they do not have to be written at the same time. A-PREP (Alberta Physical Readiness Evaluation for Police) is the physical abilities test used by all municipal police agencies in Alberta. The A-PREP can be a very challenging test to successfully complete if you haven’t trained specifically for it. The Calgary Police strongly encourages applicants to come prepared for this stage of the process in an effort to minimize delays. An assessment of aerobic fitness (the Aerobic Shuttle Run). For a detailed description of the A-PREP test please see “Fit to serve” below. The step involves the applicant sitting down with a file manager and reviewing in significant details their PDF document and personal history. Most importantly, this interview assesses your integrity and honesty. The Calgary Police places much weight on your ability to take responsibility for past actions. Be prepared: the interview can be long, so plan to spend several hours with your file manager. The Behavioural Descriptive Interview (BDI) is based on the philosophy that past behaviour is the best predictor of future behaviour. The interview helps the Calgary Police evaluate an applicant’s character. These competencies reflect the skills and behaviours demonstrated by successful police officers. Each behavioural competency question relates to an experience or event in an applicant’s past. You will be invited to write psychological exams after passing the panel interview. These tests take several hours to complete and are not something you can study for. File managers will provide additional information to applicants as they reach this step in the process. A polygraph is a lie detector. A specially trained polygraphist will conduct this examination. Please note that the Calgary Police is conducting a pre-employment polygraph, not a criminal interrogation. If you have been honest and up front throughout the application process, you should have no concerns about this stage. At this point, a retired CPS member will conduct a background investigation on your file. They will interview various people from your life, including present and past employers and colleagues, friends, neighbours, etc. They will contact people you have identified in your application package and others you have not. At this stage your file manager reviews the entirety of your application and the recruiting unit Sergeant determines your suitability for hire and competitiveness against others in the applicant pool. It is at this stage that your file manager presents your application to a board of senior officers and recommends you for hire. This board of officers makes the final hiring decision and recommends applicants for hiring or deferral. You will receive a call afterwards from your file manager advising you of their decision. Congratulations, you are now conditionally employed as a CPS police officer! At this stage, a physician contracted by the City of Calgary will conduct a pre-employment medical exam on you to ensure you are suitable to perform the tasks related to police work. The following FAQ is taken from the Calgary Police website. 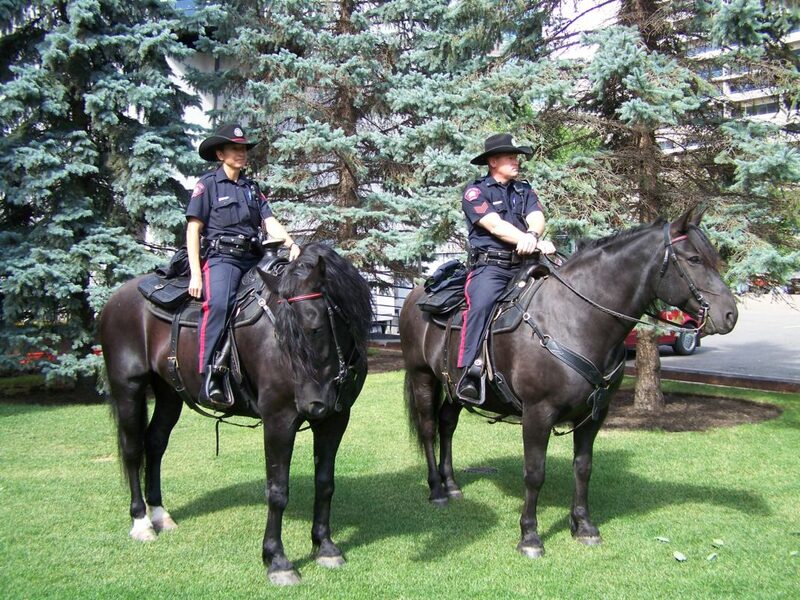 The Calgary Police Service was founded in 1885. How many people does your organization employ? How many locally? Currently CPS has approximately 2100 officers and 800 civilian support staff. Serving the citizens of Calgary, making a difference in the community. Every day is different exciting, dangerous fulfilling and rewarding all in one day. There are over 150 different units within the Calgary Police Service with internal/external education and training. You can choose your path and be in control of your future within the service. How would someone find out about opportunities at your company? How can a candidate apply? Check the website join.calgarypolice.ca or attend the information sessions held once a month at the Police headquarters. Find all dates and information on the website. The Calgary Police Service is looking for well-rounded individuals who possess a variety of skills and personal qualities, so our hiring is based on several factors. Preferred qualifications include having at least two years of post-secondary education and/or consistent employment history, and some work experience that involves responsibility and trust. We also consider volunteer experience, computer knowledge, and interactions with the public as part of our recruiting process. What type of education/training/equipment do you require? The minimum required education to apply is grade 12. Check our website for additional requirements. The Calgary Police conducts training at Westwinds headquarters. Training is 6 months long. Calgary Police Service supplies all uniforms and equipment. Provide a wage range for entry level positions. 5th class constable starting wage is approximately $66,000/yr. What are the hours of the business and general shift times? Are there a minimum number of hours someone needs to work per week? Is there flexibility regarding school schedules? Shift work is mandatory and a typical shift schedule is two days two nights, followed by four days off. Shifts can range from 10 to 12 hours. Depending on the unit, work schedules and hours can change. Is a uniform provided or do employees have to pay for it? The following information has been adapted from the Calgary Police website. Is my lifestyle one that exhibits high moral character? Do I have the self-confidence to be assertive when the situation demands it? In the face of uncertainty, can I make necessary decisions? Do I demonstrate leadership qualities? Do I have any medical conditions that would limit my ability to do police work? Does my experience reflect an ongoing interest in serving my community? Do my moral, philosophical or religious beliefs prevent me from using deadly force if required? Able to work with all kinds of people in a variety of situations. The type of person who seeks out a challenge. Physically fit, emotionally stable, and responsible. Prepared to work in all types of weather conditions. Just as comfortable working alone as in a team environment. Willing to work shifts, including evenings, nights and weekends at any time of the year. Able to use my own initiative and work with a minimum amount of supervision.